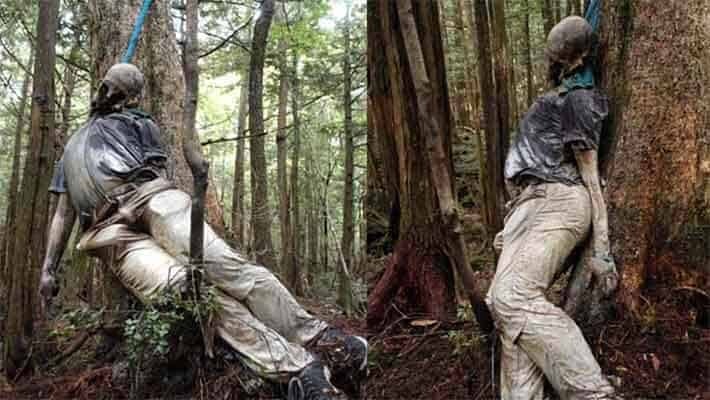 The Aokigahara forest, more commonly known as the Suicide Forest is a creepy place filled with horror and one of the most terrifying places on Earth. This spooky forest is also known as the Sea of Trees due to the dense amount of pine trees and frequent stories of people getting lost. The Suicide Forest is located near Mount Fuji in Japan and spreads approximately 13 square miles of captivating wilderness. This strange and mysterious place is one of the most popular locations in the world for people to commit suicide. 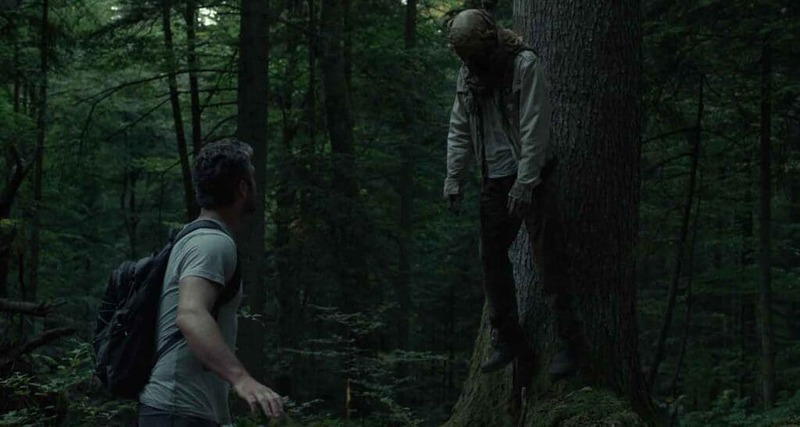 The Suicide Forest is believed by many to be haunted so it has become an increasingly popular travel destination for tourists who are looking for a scary vacation adventure. Just thinking about the eerie reputation of the Suicide Forest can cause a creepy feeling, but anyone who is brave or dumb enough to enter this shocking place, should beware the dangers lurking in the shadows. Before entering the Suicide Forest, one might notice cars covered in dead leaves from being parked and abandoned by people who may have recently followed through with their suicidal thoughts. There are several disturbing signs posted near various trail entrances warning people not to enter the Suicide Forest. The signs also encourage visitors to consider their families and to contact the suicide prevention center. The trails are lined with ribbons, string and plastic tape that are used to mark ways out of the Suicide Forest to prevent people from getting lost. Visitors will often line their paths with ribbon to help find their way out. Others, who are contemplating suicide, will often leave a ribbon trail just in case they happen to change their minds and want to leave. The Suicide Forest is cluttered with discarded personal items like shoes, socks, umbrellas, backpacks and even empty tents. Straying off the main trails can be extremely dangerous because the ground in many areas is covered with web like veins of sprawling tree roots growing every which way. There are also countless fallen trees scattered and piled everywhere in the Suicide Forest. There is an ominous vibe of discomfort in the Suicide Forest and the overwhelming number of abandoned campsites only makes things worse. Cellphones, GPS and even compasses frequently do not work in the Suicide Forest due to the hardened lava beneath the soil from the last volcanic eruption of Mount Fuji. Many fright seeking travelers to the Suicide Forest have reported claims of ghost sightings, hearing whispering voices and even loud shrieking screams. It is common to find used rope nooses hanging from branches and very possible to stumble across a fresh dead body or decomposed skeleton when wandering around too long. The deeper someone explores the Suicide Forest, the easier it is to get lost, hurt or possibly even succumb to the frightening evil forces of the alleged wicked spirits within. Current estimates speculate that more than 100 people commit suicide in the Aokigahara each year. The last time statistics were published was in 2010 with 247 attempted suicides and 54 bodies found. The statistical facts regarding the number of corpses found in the Suicide Forest are no longer released by Japanese authorities as part of their efforts to deter more deaths in the future. The most common methods of suicide in the Suicide Forest are hanging themselves and drug overdose. The dark and powerful history of this dreadful forest stems largely from Japanese mythology and belief that the yūrei or ghosts of the dead dwell inside the forest. It is Japanese tradition to believe that all people have a soul or spirit called the reikon. After a person’s death, the spirit exits the body and then transcends to a place of purgatory. The spirit waits until its body is respectfully laid to rest with a proper funeral. When the deceased are treated with correct respect, many Japanese believe this will allow for the spirit to peacefully pass on and unite with its ancestors. The dead are honored at the yearly Obon Festival and it is believed that these good spirits will protect the remaining living family in times of need. In cases where someone dies by suicide, if a proper funeral and rites are not completed, the spirit is believed to transform into a yūrei or evil spirit. The yūrei are then able to go back to the physical world as ghost spirits who will haunt the living. This traditional Japanese belief is one of the main reasons for the chilling nightmare and spooky reality that exists within the Suicide Forest. There are many well know reported claims by people who have encountered mysterious happenings and feelings of terror within the forest. There was a woman who said she unknowingly got lost deep in the woods after someone had cut the tape she left to track her path with. She luckily survived, but how her tape was cut is still a mystery. Is it possible that a yūrei was responsible? A paranormal investigation Syfy show called Destination Truth documented the Suicide Forest in 2008. Some believe there were possible spiritual apparitions recorded by the camera while filming. Was it just a camera glitch or could this have been an image of the actual yūrei? Many people have reportedly claimed to have heard the freaky high pitch screams of the yūrei when visiting the Suicide Forest. One man who was a writer at the Japan Times described hearing one of these terrifying screams deep in the Suicide Forest. He went looking to find where the scream was coming from and discovered a decaying dead body. Could the scream have come from the yūrei of the dead body he found? Entering the Aokigahara has been known to give people an unexplainable and supernatural feeling of terror. It is probably the closest thing to being in a real-life Stephen King book or horror movie like “The Conjuring”. There have been horror movies, documentaries, books and even comic books written about the extraordinary events in the Suicide Forest. 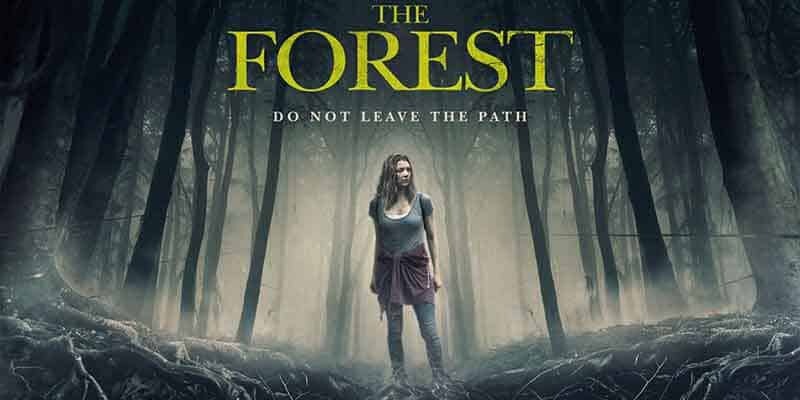 The most recent and well-known movies about the Suicide Forest are “The Forest” from 2016 and “The Sea of Trees” in 2015, starring Matthew McConaughey. To many people in Japan and worldwide, the Suicide Forest of the Aokigahara is an extremely haunted place of eerie horror and certainly one of the creepiest places in the world.